HTC has again a new Android smartphone on offer. The HTC One SV is an LTE smartphone. However, this is not the HTC One XL compete, rather it is a middle-class smartphone for users who want to have absolutely LTE connectivity. 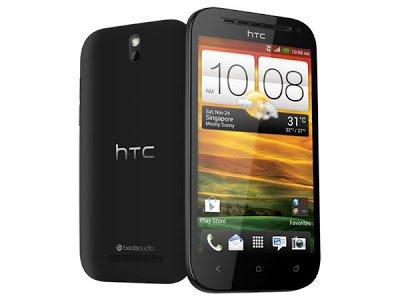 For the technical specifications of the HTC One SV not not necessarily high-end . The HTC One SV is the latest LTE smartphone of the Taiwanese. However, this smartphone is only intended for the Asian market. Thus, at least until now, the state of knowledge. If and when the HTC One SV will be released in Europe, which is not yet fixed. But why Smartphone the name HTC One SV bear is unusual due to the fact there is nothing in common with the HTC One W has. And now to the specifications of the HTC One SV . Inside tinkers a Qualcomm Snapdragon S4 1.2 GHz dual-core processor supported by 1GB of RAM. The internal memory of the Smartphone is 8GB, but this is expandable through microSD slot. The 4.3-inch Super-LCD2 display HTC One SV comes with 480 x 800 pixels resolution so. The camera of the HTC One SV dissolves with 5MP. These come with features such as LTE 800/1800/2600 MHz, Wi-Fi 802.11 b / g / n, Bluetooth 4.0, GPS, NFC and DLNA. The battery of the smartphone has 1.800mAh, in view of LTE seems to me just a little short. The HTC One SV is "still" with Android 4.0 and Sense 4.0 and the price is the equivalent of EUR 439.00.